Secretary of State for Business, Vince Cable took part in a whistle-stop tour of some of Bristol’s innovative and growing businesses on Thursday 3rd April. His tour included visits to businesses recently awarded funding from the West of England Local Enterprise Partnership’s (WE LEP) £25 million Growth Fund, which is supported by the Government’s Local Growth Fund, to see how the money has helped local businesses to grow. The Business Secretary joined the WE LEP for a special board meeting in the Bristol SETsquared Centre at Engine Shed, for a round table discussion on the key issues in driving growth and job creation, as well as the strategic economic plan submitted to Government by the WE LEP earlier in the week. A tour of Engine Shed, Bristol’s newest innovation hub – a £1.6 million refurbishment of Brunel’s original train station and a unique collaboration between the University of Bristol, WE LEP and Bristol City Council – followed the meeting. 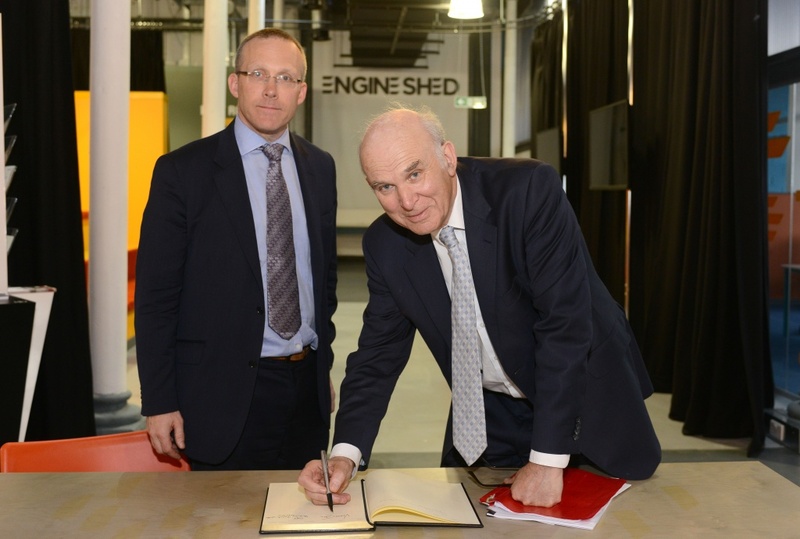 Nick Sturge, director of Engine Shed and the Bristol SETsquared Centre, introduced Vince Cable to three fast growing, highly successful SETsquared businesses: Blu Wireless Technology, Plexus Planning Ltd and Fusion Processing Ltd. Blu Wireless Technology have just received £1 million from the Growth Fund. Bristol Mayor George Ferguson and Colin Skellett, WE LEP chair, talked the Secretary of State through the plans for Bristol Temple Quarter Enterprise Zone. His visit ended at the Pervasive Media Studios at Watershed, where he met with PocketSpaceCraft . Business Secretary Vince Cable said: “Intelligently targeted government support is helping small businesses across the country to grow and create new jobs. Colin Skellett, WE LEP chair, said: “We were pleased to have the opportunity to showcase some of the innovative and internationally significant projects in our region. It was good to be able to demonstrate how the local growth fund money has helped local companies to grow. The first round of our West of England growth fund has allocated almost £15 million to nearly 150 local businesses and this in turn has attracted more than £52 million of private sector investment. “The LEP Board also had the opportunity to discuss with the Secretary of State what else needs to be done, in particular, to support SMEs, to develop the skills we need for a growing economy and to continue to grow our successful inward investment capabilities”.